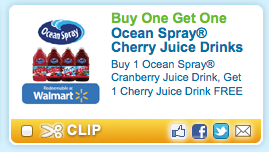 B1G1 FREE Ocean Spray Juice Coupon! Hurry over to Coupons.com to print this great coupon. These frequently go on sale for around $2.50 or less, so only $1.25 or so after coupon, which is a great price for big bottles!